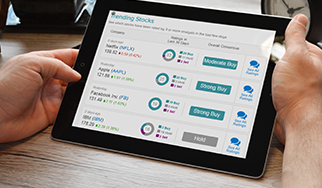 TipRanks Analysts’ Top Stocks is one of the many tools available to TipRanks users and the perfect tool for investors who want to find fresh investment ideas. Top recommended stocks factor in ratings made by the best-performing analysts with the highest average return and success rate to give you confidence in your investment decisions. These two crucial indicators show how often the expert’s recommendations were profitable and the average return an investor would make per recommendation. Hundreds of thousands of investors use Analysts’ Top Stocks, which is backed by TipRanks’ powerful financial accountability engine. Our transparent, unbiased technology uses Natural Language Processing (NLP) algorithms to provide a data-driven measure of accuracy based on the statistical ability of an expert to generate profits and make correct stock recommendations. 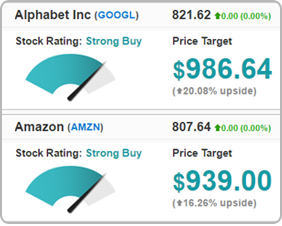 Now to find the best stocks for you: click the small head logo in the top right hand corner to adjust your selections based on an analyst’s performance. 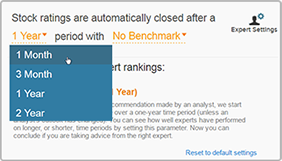 Set filters to measure analysts against different benchmarks. Are you a short-term investor? Longer term, maybe a year or two? You can see how the analyst has performed over four different investment time spans. Filter the analyst recommendations by position (strong buy/ strong sell), market cap size and eight different sectors. Interested only in your own specific sector? Find the top stocks in your sector be it tech, healthcare, financial etc. Next, sort results by company name, upside % or market cap. Want to find those small-cap rockets? 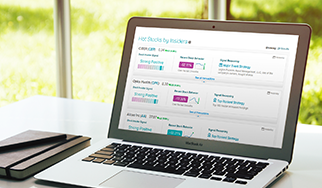 Find the hot stocks in your market cap of interest. The result is an accurate and reliable list of recommended stocks which includes crucial investing information. Check out the analyst consensus rating (based on the proportion of buy/ hold/ sell recommendations in the last 3 months), the average analyst price target, recent stock behavior and the rating reasoning to find out why that stock has been recommended to you. In the screenshot for example you can see that, at the time of writing, MTSI is one of the most recommended stocks because all recent top rated analysts have given the stock a buy rating. Click on the follow button to receive alerts of new analyst ratings for the stock. Have a question about the Analysts’ Top Stocks Tool?